Louisiana: 1944. At an army base, a black sergeant is killed by US military issue weapon. Washington, D.C. Army Command, afraid of the prospect of a race riot, sends their best investigator, Captain Davenport, down to assess the situation. The choice of Davenport, however, was fraught with issues; Davenport is a black man with an officer’s commission, being asked to investigate a possible race-based murder in the South on a US Army base. Although someone of his rank and stature would normally be respected, it is apparent that the uniform he wears is no shield to the racism of everyday America. At the base, Davenport’s presence is met with apprehension by White soldiers and officers, and with pride by the black soldiers. There is, however, a moment where someone leaves a disparaging message on Davenport’s mirror. As Captain Davenport begins his investigation, we find that the murdered black sergeant, named Watters, represents only the tip of the iceberg in this case. The murder of Watters starts to center around another soldier named C.J. Memphis. Although C.J. was well-liked by both black and white soldiers, Watters grew to despise him for this popularity. It also did not help matters that C.J. did not share Watters’ anger for White mistreatment of Blacks (even though it is apparent that C.J. acknowledges that he is mistreated as well). Davenport begins to see a pattern emerging concerning C.J. and Watters, and that the connection of the two men may provide the link that he was looking for. Ultimately, however, the investigation takes a turn when evidence points to two White junior officers who were placed at the scene of the crime. When Col. Nivens, the base commander, attempts to prevent Davenport from questioning them, Davenport gives him an ‘implicit threat’ that the coverup attempt would be ‘leaked’ to the Black soldiers and Washington DC brass. When questioning the officers, it becomes clear that while they are bigoted towards Blacks, and even implicitly attempted to threaten Watters, they tell Davenport that only the Military Police and “Special Duty” people have access to live ammo. Davenport releases them and realizes that this was a dead end to the investigation. He re-questions Private Wilkie, and we find out that he was once a Sergeant that Watters had busted. Watters’ hatred for CJ had reached a fever pitch, and concocted a plan to scare him straight. They faked a shooting and planted the gun under CJ’s bunk. Finally pushed to the edge, CJ assaults Watters and is arrested. That plan goes awry when CJ commits suicide in the stockade. Watters, unable to cope with the fact that CJ committed suicide, had turned to drinking to salve the pain. Davenport continues to question Wilkie on the events surrounding Memphis’ suicide. It would be at this moment when the base is put on 24-hour standby alert, as the Allied forces have invaded the coast of France. While most of the base celebrates, Davenport orders Wilkie arrested. Another soldier, named Smalls, attempts to run away from the base and fails to catch up with the train that would lead him to freedom. Unfortunately, he is captured by a garrison stationed by the tracks. After being led back to the stockade, Smalls confesses to Davenport. He and Peterson, assigned to guard duty that night, came across a drunk Watters and Peterson decides to extract his own justice. Moments later, Peterson, captured by Military Police, is placed into the same interrogation room as Smalls. Peterson also confesses to the murder, and gives his reasons for doing so. Davenport admonishes the both of them and orders the MPs to take them away. Davenport looks out the window and expresses his sadness over the entire investigation. The next morning, the base holds a march as they are being set to deploy for operations in Europe. Captain Davenport and Captain Taylor reconcile their differences as Davenport sets off to return to Washington, DC, his investigation completed. If there was a height of “Black Cinema” in the US, it would be the late 1970s to mid 1980s. The industry began to move away from “Blaxploitation” movies (characterized by movies like “Black Ceasar” and “Foxy Brown”) and attempted to create more serious (read Mainstream) fare for public consumption. A Soldier’s Story was one of the first attempts to do so. Sgt. Watters arresting CJ Memphis under false pretenses. The most difficult erasures to deal with come from those who share your own background. If anyone understands the state of American racism, then one recognizes that this movie could not be scripted in any other fashion than this. However, there is a lesson that the movie sums up very well: No one really has the right to declare invalid, nor can erase, the experiences of others. In this case, Watters, despite his intentions, erased CJ’s blackness simply because CJ chooses not to fight every battle against White supremacy head-on. Watters talks of his experiences in France during World War I, when White soldiers paid a Black soldier to dress like a monkey and act like a fool, reinforcing the “Black Man as an Ape” caricature prevalent in White Society. According to Watters, the rest of Black soldiers of the unit eventually killed him. And it is this kind of incident that Watters fights against that shaped his animosity towards CJ, and eventually Watters’ erasure of CJ’s blackness. A White Officer Saluting a Black Officer. This was practically unheard of in World War II. Against the backdrop of the investigation lie the attitudes of White American Society towards Black people in general, and their consternation of anything that threatens the pillars of White Supremacy, with the threat being represented by Captain Davenport. At nearly every turn for Davenport, his mere presence shakes the foundation that White Supremacy had concocted, and there had been many overt attempts by White Officers, particularly Lt. Byrd and Captain Wilcox, to denigrate him and disrespect both his rank and his position by attempting to remind him of his “inferior” Black status. 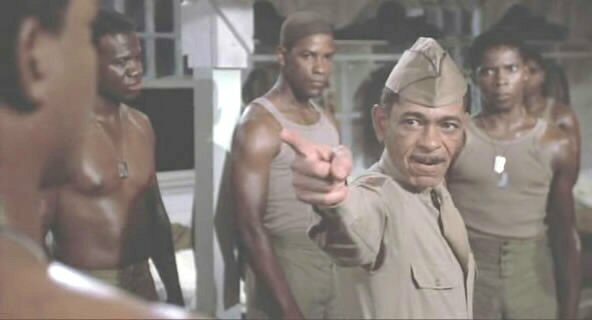 Where Nivens was your classic Republican racist, Captain Taylor (above) represents someone who is otherwise Liberal, but is still racist through his actions. 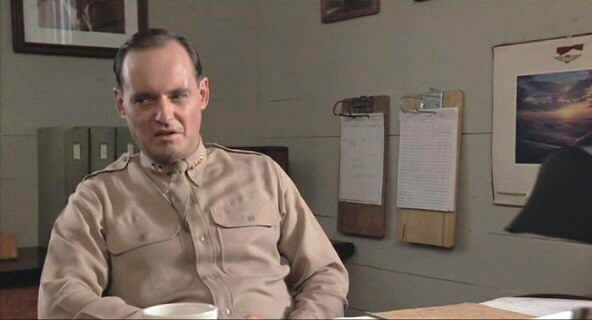 This actor looks good wearing a commissioned officer's uniform (see "Courage Under Fire" and "Crimson Tide"). Much like An Officer and a Gentleman was supposed to be the movie that launched Richard Gere and Debra Winger, A Soldier’s Story was supposed to launch Howard Rollins into the spotlight. Unfortunately for all three actors, there was a supporting cast member whose performance so outshined the rest that not many people remember the lead actors and what they did in the movie. 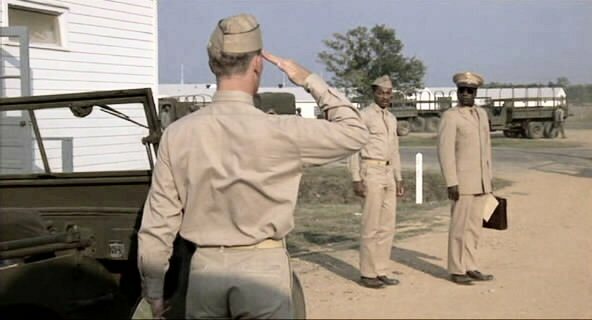 In Officer, it was Louis Gossett as the tough drill instructor Sergeant Foley. 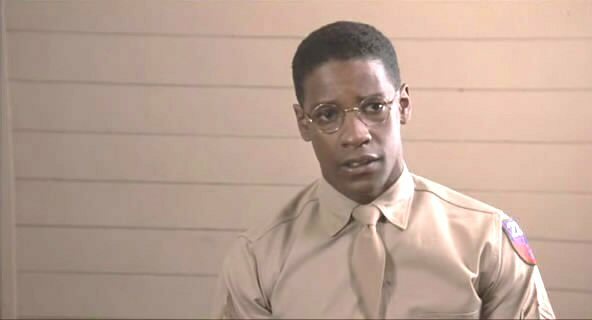 In Soldier’s, it would be Denzel Washington was Private Peterson. The trademark intensity that would mark a typical Denzel performance was on display in every scene, and became its own focus, for the most part. Denzel would take this character – lock, stock, and barrel – and port him over to the role that would propel him to stardom, in Glory. Even in movies like this, women are still nothing more than eye candy. Intersectionality: 404 not found. As I have often done with movies, even one like this, I point out what movies like this one lack. This one is sad to do, and is especially galling, given the sheer number of Black actors and extras throughout the movie. The unfortunate part of this movie is that there are very few Black women in any appreciable role. The only one who has any extended part is Patti Labelle, and she is a singer for the club that C.J. Memphis plays in. There is one other black woman who is big fan of C.J.’s ballplaying – and kisses him when he gives her a ball that he caught to prevent a home run. Discussions with this gesture are usually heteronormative. And are poor attempts to re-affirm one's masculinity. Like most movies of the genre, there is always a scene that has no other reason to exist than to affirm the heterosexuality and reaffirm gender roles/stereotypes. In this case, there is a get-together after the game and the guys of the team are busy talking about the girl that kissed CJ, describing her in ways that are supposed to affirm their status as men – which disparages this woman at the same time. In other words, her humanity is erased and reduced to meat market status. A Soldier’s Story is one of those movies that can be viewed on many levels, but still manages to be somewhat entertaining. It is not without many huge faults and its lack of Black Women in a film that attempted to showcase a portion of the Black Experience is a minus that will never go away, no matter how much handwaving is attempted. The actors in this film turn in decent performances, and Adolph Ceasar would give his last performance onscreen with this film. There are a number of actors in this film who would go on to find a level of stardom beyond this movie, although Washington’s star would shine brightest by far. Unfortunately, all of these actors, much like their onscreen roles, would have to face Hollywood’s racist tendencies and visions of White Supremacy in their own ways, with very mixed results. 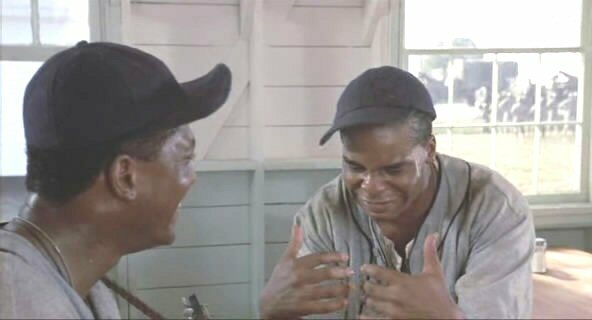 At least, however, this movie gives a better representation of the Black Experience than another film which would come out many years later…Glory. This entry was posted in Movie Haterade and tagged Analysis, Black Cinema Review, Movies, Movies That Hate You, People of Color, Review. Bookmark the permalink.